Courtesy of Michael Bloom Media Relations. Photo by Dorothy Collins/Art Pazornik. Used with permission. 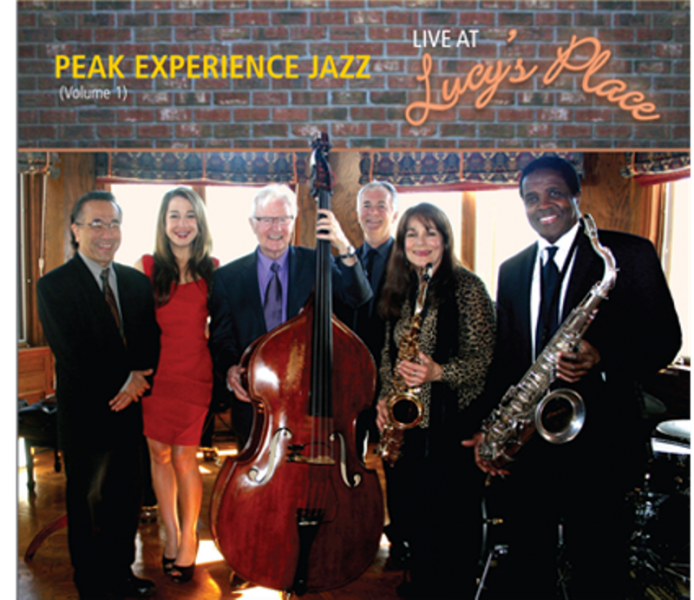 After enthralling audiences throughout Southern California with their straight ahead jazz music, the Peak Experience Jazz Ensemble has released their debut album titled Peak Experience Jazz Live at Lucy’s Place (Volume 1) for your further listening pleasure. The 9 tracks are a collection of newly arranged versions of such jazz favorites as Sonny Rollins’ “Tenor Madness,” “Angel Eyes,” and the Great American Songbook standard “Sweet Georgia Brown,” among other jazz, pop and original compositions penned by Mike Peak. The album was recorded during a benefit concert by the group in December 2014 and features Peggy Duquesnel, a veteran pianist, vocalist, composer and arranger who also serves as the co-producer of the CD. The core members of the Peak Experience Jazz Ensemble includes Rickey Woodard on tenor sax, Ann Patterson on alto sax, tenor sax and flute, Andrea Miller on vocals, Ron Kobayashi on piano and Kendall Kay on drums. Their dynamic stylistic diversity, emotional urgency, high energy and sweeping big band influence sets them apart from average jazz bands. One listen to Andrea Miller’s 21st century update of “Angel Eyes,” will endear you to this song all over again. This music is capable of yielding highly effective aural pleasures! “Imagine,” “Cry Me A River,” and “Just One of Those Things” are all songs that this ensemble presents as great aural innovations without actually having to experience the story behind the songs’ titles. John Lennon’s “Imagine,” as sung by Andrea Miller with Ron Kobayashi’s great solo and Ann Patterson’s flute fills, is now performed in a framework that makes sense of the many paradoxical ways that its lyrics are understood. “Cry Me A River,” features an exceptional solo by tenor saxophonist Rickey Woodard as he underlines Andrea Miller’s emotional urgency in this fresh arrangement. “Just One of Those Things” also features Woodard along with Kobyashi’s exceptional piano solo accompanying Andrea Miller’s blues-drenched interpretation. Overall Peak Experience Jazz Volume One – Live at Lucy’s Place is a delightful musical experience and one that you are sure to enjoy. From jazz to blues to pop the selected music covers a broad assortment of themes and perspectives, ranging from the heartfelt reminiscences heard on “Just One of Those Things,” and “Cry Me A River” to the thoughtful meditations heard on “Imagine.” The recording is available on Joy Spring Music.